The horror genre in world cinema has been a source of Anglo-American adaptation for over a decade. Among the first and most successful was the Japanese remake of Hideo Nakata’s supernatural film by director Gore Verbinski in 2002, The Ring. Since then material from around the world has been tapped for American interpretation that caters to English-language speaking audiences. The vampire horror-drama Let the Right One In, itself adapted from the novel of the same name, was given the remake treatment only years later by director Matt Reeves in 2010 under a new but similar title, Let Me In. Both films were shot by emerging names in cinematography who have gone on to great success; Hoyte van Hoytema, ASC, NSF, NSC for the Swedish original, and Greig Fraser, ASC, ACS for Reeves’ American adaptation. The Australian cinematographer worked in his home country for many years with directors such as Scott Hicks and Jane Campion for her 2009 film Bright Star, and has since displayed his immense talents with American directors on a diverse range of films. It is not only the technical and artistic depth of his photography that astounds, but also the sheer number of films Fraser has lensed in the US in a short time. Many of his films can be considered dark dramas, through which he has shown his strength to use both traditional and modern techniques in lighting, photography and storytelling — a strength that is recognized and valued by his directors. Fraser has shot both film and with digital cameras, believing that each medium has its own strengths for different films. In the case of the 2012 film Snow White and the Huntsman, a new interpretation on the popular fairy tale, Fraser’s choice to shoot anamorphic 35mm and large format 65mm for select scenes was motivated by the fantastical qualities of the story and the epic scale of the world. To capture the low light scenes in Snow White, and then later in Andrew Dominik’s Killing Them Softly and Bennett Miller’s Foxcatcher in 2014, Fraser chose to not use Kodak’s Vision3 500T 5219 film emulsion but instead a short-lived alternative; Kodak 500T 5230. Introduced after 5219 Fraser cites the new 5230 stock as having a raw and textural feel that is translated into the final look of his films, equating the difference between them to the look found in a glossy photographic print versus a matte photographic print. Using the alternative film stock alongside Vision3 50D 5203 and Vision3 250D 5207 on the Olympic wrestling drama Foxcatcher, the cinematographer used the format as a further means to suspend the disbelief of the audience to the events seen in the period-set film (Let Me In is also set during the 1980s but was shot anamorphic on Vision3 500T 5219). The filmmakers also describe the cosmetic effect of using film to sell the prosthetic makeup applied to Steve Carell to make him appear more like his real life, non-fictional counterpart. In contrast to his film work Fraser’s collaboration with Kathryn Bigelow on Zero Dark Thirty, again released in 2012, was captured digitally using Arri Alexa cameras. In pre-production meetings with Bigelow to discuss shooting format the cinematographer tested various cameras, both professional and consumer level, to determine the best system to capture a wide range of lighting and environmental conditions. The chosen system had to endure extreme heat in the practical locations of Jordan and India, and the nighttime raid in the film’s final act demanded extreme low light sensitivity to create stylized but subjectively convincing images. 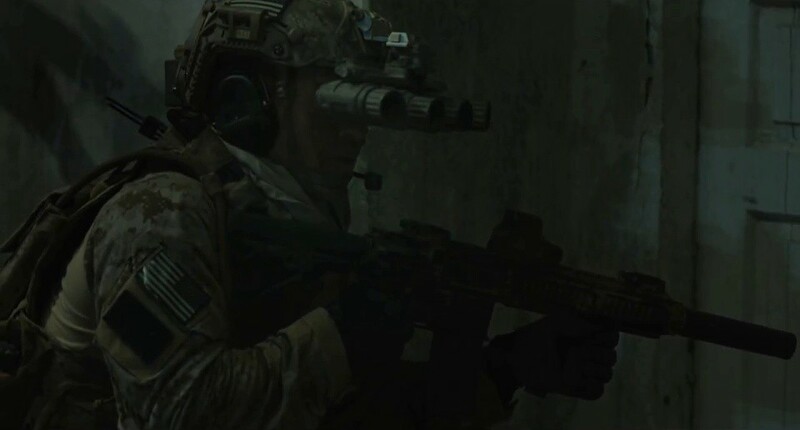 Rather than using post production trickery Fraser was also able to duplicate the look of infrared night-vision scopes, used by the Navy SEALs during their raid on the compound, by adapting commercially available models directly to the production’s Alexa cameras. To streamline the digital workflow on set custom backpacks were built to minimize mobility issues, eliminate unwieldy cable lengths and provide Bigelow with a live video feed via a remote monitor during production. Whether shooting film or digital Fraser takes into account the creative and practical considerations of using one format over the other to best serve the production, the artistic vision of the director, and the final product as seen by the viewer. In the same way a chosen format can influence the aesthetic and viewers response to the image Fraser also explores the potential for lenses to best capture the emotional nuances of character and atmosphere. In frequent partnership with Panavision Fraser has utilized an expansive range of vintage, modern and modified lenses in a multitude of combinations including spherical 35mm and digital, anamorphic 35mm and digital, and large format 65mm. For the latter System 65 lenses were used on Snow White and the Huntsman on wide and establishing shots for their resolution and clarity, which Fraser cites as having similar properties to his own Mamiya and Hasselblad medium format lenses for stills photography. A recurring lens format choice for Fraser has been anamorphic cinematography, as seen in Let Me In, Snow White and the Huntsman, Killing Them Softly and The Gambler. The anamorphic lenses supplied by Panavision form an eclectic diversity in terms of age, optical fidelity and creative possibilities that can be harnessed by cinematographers to tell both intimate character stories and invoke scale to epic narratives. The character of individual lenses has often been exploited by Fraser, who chooses to shoot with several series of anamorphic lenses available from Panavision on a single production; on Snow White the more recent G-series anamorphics were described by Fraser as having a “glamorous feel” when photographing actresses Charlize Theron and Krisitin Stewart, while in addition using both the older E-series and optically superior Primo anamorphics in other scenes. Perhaps the most widely recognized name in Panavision is optical engineer Dan Sasaki, who was essential in Fraser’s desire for particular lens characteristics that would best capture the emotional and technical specifications of scenes or even individual shots. To capture the emotionally distant and dark world of Let Me In Sasaki was tasked by Fraser to create custom high speed anamorphics for the production that would emulate the perspective and optical imperfections of certain characters in the film. In the crime drama Killing Them Softly an older HS50 anamorphic lens was customized to increase flaring and create a subtle doubling and over-elongation in the background bokeh; much of the film is shot at fast apertures on high speed and E-series anamorphics to capture very narrow depth of field and maximize optical aberrations such as flare and out of focus distortion. In much the same way the choice of format is determined by the story being told the choice of lenses can be of equal importance. For the guerilla approach to the photography of Zero Dark Thirty anamorphic capture was thought by Fraser to not be appropriate in the context of the decade long, world spanning narrative that balances covert intelligence with military action. In Fraser’s photography the story decides the vision — and it is the duty of Fraser, his director and their production team to accomplish this vision at their discretion and through appropriate choices. In hand with Fraser’s affinity for emotionally dark stories is his approach to lighting. Before a lens can transmit light to the image plane the creative choices and physical effects of illuminating people and spaces is the most important tool to convey the emotional tone of a scene. The intensity, colour and quality of light has been used by Fraser in unison with the composition and perspective of the camera to create a variety of natural, impressionistic and stylized imagery during his career. Practical light sources and specialized lighting equipment were used to ground the supernatural events of Let Me In and the bleak nighttime landscapes of Killing Them Softly over using conventional film lighting in several instances. Industrial fluorescents, sodium vapor, mercury vapor and metal halide light sources, seen frequently in the real world in various applications, often contain a limited spectral response that produce strong monochromatic colour. Unlike film lights that are designed to produce accurate colour practical sources are more concerned with effeciency over colour fidelity. Their use by Fraser and his lighting crew contribute an authenticity that using coloured gel filters on film lights does not. Custom made lighting softboxes called diving bells were also used on both films; used as large scale spacelights fingers of black duvetyn could be raised and lowered to control the distribution and spill of soft, diffused light in scenes where ambient light acts as the main source. Diving bells were used to create a seemingly source-free ambience during a suspenseful sequence of Let Me In which is played out in cinematic darkness — the viewer would in reality see nothing, but the quality of the light suspends this disbelief and subconsciously contributes to the storytelling of the sequence. Stylistic choices and an effective lighting gag were used in Killing Them Softly to heighten the brutality of one scene and serve the visual impact of another. Wrongly accused of plotting a robbery Ray Liotta’s character, Markie, is savagely beaten in a prolonged scene during a rainstorm. Fraser chose to light the beating in an ugly and visceral manner, using bright front lighting to evoke a “journalistic effect” and deliver an uncompromising view of the bloody, detestable act. In another scene Brad Pitt’s hitman executes one of the real thieves with a gun at point blank range. For the safety of the actors a strobing LED light was synchronized to Pitt’s pulling of the trigger on the dummy pistol; when Pitt pulled the trigger the strobe light duplicated the characteristic flash of light as the gun was fired (the muzzle flash itself was created in post production). In a short time working for American directors Greig Fraser’s bold visuals and knowledge of cinematic craft has attracted the attention and demand of celebrated filmmakers. Beyond Jane Campion’s Bright Star I haven’t seen Fraser’s work with Austalian and New Zealand directors — it is an oversight that I will amend. There is always more to find and discover about the names found in the credits, always more to learn about the art and craft of filmmaking. With each name, discipline, theory and philosophy we have the foundation to create and inspire others in the future — artistry will never end. Subscribe, Like, and Follow us on iTunes, Facebook, Twitter, & Flipboard!